Medals presentation for underage teams will take place saturday 18th feb at 7.30 in the hall. All ireland winning Dublin footballer Cormac Costello will present the medals. All are welcome!! 10th anniversary of winning the county junior football c'ship. U16 C County semi-final won. Well done to Adrigole U16s who won their U16 C County semi-final game against Kilnamartyra yesterday!! They will now meet Dromtarriff in the County Final. Date and time yet to be confirmed. U16 County C'ship Semi final-Adrigole V @GAACillnaMartra tom, Sat, in Bailneen @ 2.30pm. Let's get behind the lads and fly the red and white. Well done to the Adrigole U16 Team and their management on their win over Naomh Aban on Wednesday evening in Aughaville!!!! This match was a double victory for Adrigole as it was both the league and championship u16 C western final. 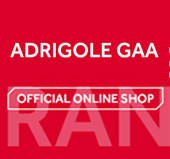 Tomorrow Saturday 1st - U16 championship replay - Adrigole v Kilmichael in Adrigole at 2pm . Sunday Oct. 2nd - Beara U21 final -Caha Gaels vs Urhan in Cahermore at 1pm . Due to the weather the league game between Adrigole and @clongaa fixed for today in Adrigole has been postponed.